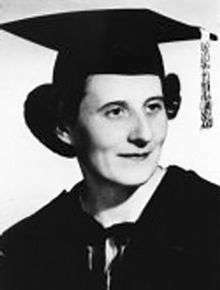 Anna Poray or Anna Maria Poray-Wybranowska (10 February 1919 – 25 July 2013) was a Polish-Canadian scholar best remembered for her scientific research into the history of Christian Polish rescue efforts during the Holocaust in occupied Poland. She was a professional librarian with a PhD in political science, and Director of the Polish Library in Montreal, Quebec, Canada. Poray-Wybranowska published a ground-breaking book entitled Those Who Risked Their Lives in 2007, featuring thousands of wartime stories and biographies of heroic individuals who, under the threat of death, helped Jews during World War II. Some 30,000 of them were murdered by the Nazis for trying to save Jews, wrote Poray. Anna Poray-Wybranowska née Chościak Popiel, was born into a noble family bearing the Sulima coat of arms in Ściborzyce, Little Poland, soon after Poland's return to independence. She finished primary education at home, and the private secondary school Sacré-Coeur near Poznań. She studied at the Université libre de Bruxelles in Belgium before World War II. Anna returned to her homeland during the September Campaign of 1939 and left after Poland's defeat, to continue her education in Perugia and Rome, Italy. She spoke five languages. Poray joined the Polish Armed Forces in the West while in Italy. She served with the Women's Auxiliary Service as an administrator, and a librarian in the Archives and Museum of the Second Corps of the Polish Army. Soon after the war ended, she went to Argentina with her new husband, Count Jan Poray-Wybranowski, whom she married in 1947. A few years later they immigrated to the United States. Michał Kruk and several others from Przemyśl hanged on 6 September 1943 as capital punishment for trying to hide Jews; listed by Anna Poray. Poray obtained her master's degree in librarianship from Columbia University in New York, where she also enrolled for a PhD in political science. She settled permanently in Canada with her two small children in 1961, after her husband's untimely death. Poray worked in a number of Montreal university libraries and for twelve years headed the main Polish Library in the city. In 1978 she began to research the life stories and whereabouts of Christian Poles who saved Jews during the Holocaust in occupied Poland, including those who perished as punishment for trying to do so. She began to submit testimonies to Yad Vashem in Israel on behalf of the rescuers she discovered, to receive recognition as Righteous Among the Nations for their heroism. About one hundred Poles have been awarded the status of Polish Righteous among the Nations thanks to her efforts. Also, around the same time, Anna founded a charitable organisation, "Pro Justitia", to help the most needy around the world with sponsorship from Pope John Paul II. Anna Poray cooperated with the Institute of National Remembrance since 1986, and helped found the "Committee for the Memory of Poles Rescuing Jews" (Komitet dla Upamiętnienia Polaków Ratujących Żydów) in Warsaw. 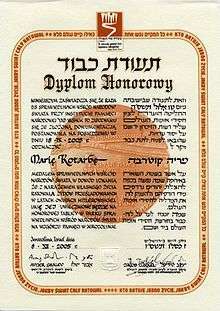 She was the recipient of numerous national and diplomatic orders and awards, including the Officer's Cross of the Order of Merit of the Republic of Poland, received in 2001. She died in Montreal on 25 July 2013 at the age of 94, survived by her two sons. Her first child, daughter Joanna died of leukaemia at the age of seven. 1 2 3 4 Jozef Popiel (7 May 2009). "Anna Maria Poraj-Wybranowska z domu Chościak Popiel" (in Polish). Popiel.org. Retrieved 7 October 2013. ↑ Anna Poray (2007). Those who Risked Their Lives (Google Books listing). Anna Poray. ISBN 0979221307. Retrieved 7 October 2013. 1 2 Editorial (22 August 2013). "Zmarła Anna Poray-Wybranowska, działaczka polonijna, Dama Maltańska." (in Polish). wPolityce.pl. Retrieved 7 October 2013. ↑ Leszek Sołek (2007). "Anna Poray-Wybranowska – dokumentalistka, autorka książki o ratowaniu Żydów przez Polaków" [Meet the Author: Anna Poray-Wybranowska]. Konsulat Generalny R.P. (in Polish). Są Wśród Nas. Retrieved 7 October 2013. 1 2 3 4 5 Staff writer (2013). "Dr. Anna Poray-Wybranowski (1919–2013)" (PDF file, direct download 146 KB). Biographical note (in Polish). Biuletyn Polonijny – Montreal Quebec. Retrieved 7 October 2013. 1 2 Anna Poray (2007). "Saving Jews: Polish Righteous". Those Who Risked Their Lives. Archived from the original on 6 February 2008. Retrieved 7 October 2013. 1 2 Obituary (27 July 2013). "Anna Poray-Wybranowski". The Montreal Gazette. Retrieved 7 October 2013.